Dear Reader: No, I have not given up on this blog. But I’ve been busy, busy, busy! In the last four weeks alone, I have traveled to the University of Arizona, Harvard University, Duquesne University, and Princeton University. Besides giving talks at each place (two public lectures and two academic seminars, with cumulative audiences of well over a thousand people), I have met with dozens and dozens of amazing scientists, from graduate students and postdocs to faculty both young and old. It’s been a blast: an exhausting blast, but a blast all the same! And next week? I’m hosting four terrific colleagues from two continents who will work with me to begin making sense of hundreds of newly sequenced genomes from the LTEE. Oh, and we have some more job searches starting next week. And did I mention? We just had a fascinating (if I may so myself) and complex paper come out today in Science (on-line express for now) on the most deeply divergent (i.e., oldest sustained polymorphism) of the 12 LTEE populations. And no, it’s not about the citrate eaters from population Ara–3. Plucain, J., T. Hindré, M. Le Gac, O. Tenaillon, S. Cruveiller, C. Médigue, N. Leiby, W. R. Harcombe, C. J. Marx, R. E. Lenski, D. Schneider. 2014. Epistasis and allele specificity in the emergence of a stable polymorphism in Escherichia coli. Science. It’s population Ara–2 instead, where two lineages—dubbed the Larges (L) and Smalls (S)—have coexisted for several tens of thousands of generations. In superb research led by Dr. Jessica Plucain that she did in the lab of my long-time collaborator (and dear friend!) Prof. Dom Schneider (Grenoble, France), Jessica led the work to identify—out of hundreds of mutations—three that are sufficient to allow a “constructed” S ecotype (i.e., the ancestor plus three derived alleles) to invade and stably coexist with the evolved L ecotype. Ecological context and specific genetic interactions are key to establishing this “half” of the polymorphism … and the other “half” of the story— what makes the L ecotype special—might well turn out to be just as complex, or perhaps even more so. The S and L types are especially challenging (even painful!) to work with because this population became a mutator very early on—before the two lineages diverged—and so there are many, many mutations to contend with; moreover, they make colonies on agar plates that are quite challenging to score and count. So congratulations to Jessica, Dom, and other members of Dom’s lab for their perseverance in studying this extremely interesting population. Also on the list of authors are Prof. Chris Marx and two members of his lab. They performed metabolic analyses showing how the carbon fluxes through the central metabolism of the S ecotype have diverged from both the ancestor and the L ecotype. Chris was a postdoc in my lab almost a decade ago, but most of his work (then and since) has been on experimental evolution using Methylobacterium, and so this is the first paper we’ve co-authored. 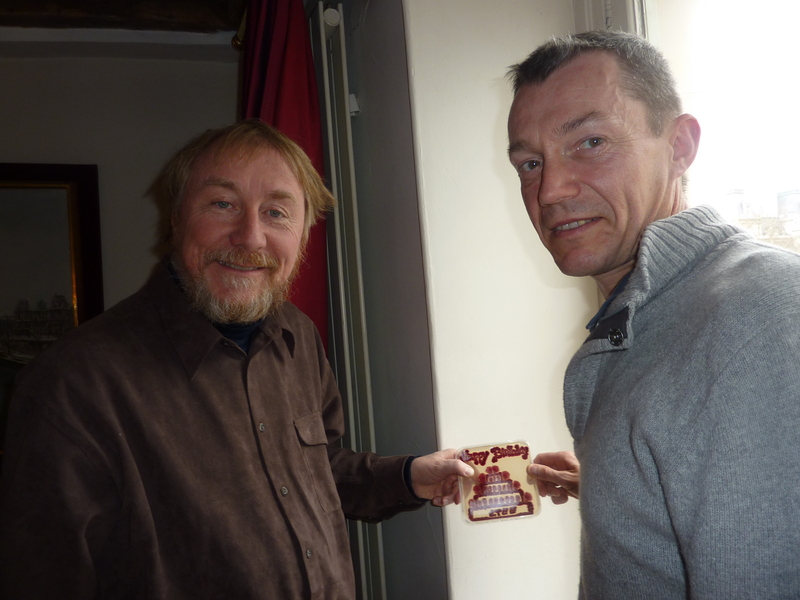 The picture below shows Dom Schneider and Richard Lenski in Paris in 2013. They are holding a petri dish that Jessica Plucain made to celebrate the 25th birthday of the LTEE. ← Satoshi Nakamoto is … Satoshi Nakamoto!